One journalist asked a warkari ( devotees who walk long distances from their place of residences to pilgrimage centres; may a times bare foot enduring all hardships on the way) devotee of Vittal who goes to Pandarpur , what’s your age? Journalist: Have you seen Vithoba once, At least once?. Warkari: No beta, not yet. Journalist: Then why do you come every year, do you believe He is there? Warkari: Can I ask you a question, from where you have come? Warkari: Do people keep pet dogs in Pune, have you seen any? Warkari: In the village also we keep dogs, that follows us to our farm to protect us from thieves. At the dead of night, when one dog sees the thief it starts barking, by hearing this dog another starts barking, likewise all of dogs in the neighbourhood starts barking; but amongst all the barking dogs 99% have not seen the thief, yet keeping faith in this 1st dog they start barking. Likewise Tukaramji, Sant Jnaneshwar, Namdev,they have seen the Vithoba so I have faith in them. One day I may also have darshan of vitthal. If animals can keep their faith in another animal, being a human being why can’t we have faith in another human being? Six years ago in Singapore, I gave a cab driver a business card, to take me to a particular address.Soon we arrived at the specified address, he circled around the building before coming to a halt. His meter read 11$, but he took only 10$. He further added that Singapore is a tourist destination. Many people come here, for three or four days. 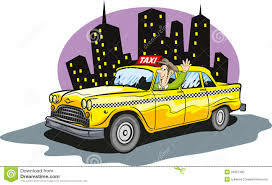 After clearing the immigration and customs, the first experience is always with the cab driver and if that is not good, the balance three to four days are not pleasant either. In my opinion, he probably did not go to school beyond the 8th grade, but to me he was a professional. To me, his behavior reflected pride in Performance and Character. That day I learnt, that one needs more than professional qualification, to be a professional. In one line…”Be a professional with a Human touch and Values”…that makes all the more difference. Knowledge, Skill, Money, Education, all comes later. First comes Human Values, Honesty and Integrity, as displayed by the cab driver. A cultured person is one who has good thoughts and good conduct. Man has no doubt mastered many ways of accumulating wealth and amassing fortune, yet happiness eludes him. Why? Because his conduct is not proper. For good conduct, virtues are most essential. A virtuous person can accomplish anything. Without virtues, life ceases to have any meaning. Good conduct should be the real basis for life. Note– The above is a real life experience. I also have recently experienced a similar incident in Singapore when the cabbie missed one exit and took a longer route; as soon as he realized that, he stopped his meter and charged me exactly what would be needed for my destination. Kudos to these honest cabbies. One Wednesday evening just before my Balvikas class commenced, one kid enthusiastically showed off her wrist bands to me. I had seen something like this before; with many people wearing the friendship bands. 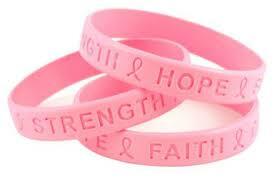 She was quick to explain that it was not a friendship band rather it was a ‘Values’ band. I had not heard about this before and soon she started rattling off what each band stood for. I was quite impressed with her understanding and appreciating the value of those bands and thought it would be a good idea for her to share it in the children section of our blog. Below is what Tanisha Mehta has to say about those bands. Every day, I get up and slip on three sparkling bracelets on my wrist. Each bracelet represents some value. The maroon and white one with a silver horse, represents love and peace. The blue and black one with a golden elephant represents knowledge and wisdom. And the light purple, mixed with white with a monster hanging from it represents protection. Whenever I am scared, speak a lie or do not practise the values; one look at the value bands reminds me that I should be following these values. 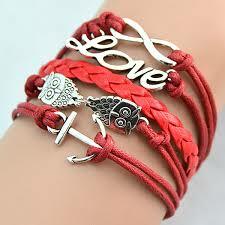 I love my bracelets which help me a improve myself and I want to thank my mom for gifting this to me. This indeed is one of the good ways of reminding oneself of the values to practise in our daily lives. Gifts like this for young children can help them to constantly practise these values regularly. One day, a professor entered his classroom and asked his students to prepare for a surprise test. They all waited anxiously at their desks for the exam to begin.The professor handed out the exams with the text facing down, as usual. Once he handed them all out, he asked the students to turn over the papers.To everyone’s surprise, there were no questions–just a black dot in the center of the paper. The professor, seeing the expression on everyone’s faces, told them the following: “I want you to write about what you see there.” The students, confused, got started on the inexplicable task.At the end of the class, the professor took all the exams, and started reading each one of them out loud in front of all the students.All of them, with no exception, defined the black dot, trying to explain its position in the center of the sheet. After all had been read, the classroom silent, the professor started to explain:“I’m not going to grade you on this, I just wanted to give you something to think about. No one wrote about the white part of the paper. 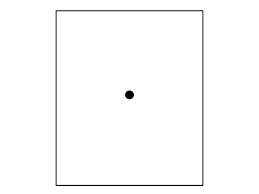 Everyone focused on the black dot – and the same thing happens in our lives. I arrived at the address and honked the horn. After waiting a few minutes, I honked again. Since this was going to be my last ride of my shift, I thought about just driving away, but instead I put the car in park and walked up to the door and knocked. ‘Just a minute’, answered a frail, elderly voice. I could hear something being dragged across the floor. After a long pause, the door opened. A small woman in her 90s stood before me. She was wearing a print dress and a pillbox hat with a veil pinned on it, like somebody out of a 1940s movie. By her side was a small nylon suitcase. The apartment looked as if no one had lived in it for years. All the furniture was covered with sheets. There were no clocks on the walls, no knickknacks or utensils on the counters. In the corner was a cardboard box filled with photos and glassware. I looked in the rear-view mirror. Her eyes were glistening. ‘I don’t have any family left’, she continued in a soft voice. ‘The doctor says I don’t have very long.’ I quietly reached over and shut off the meter.’What route would you like me to take?’ I asked. For the next two hours, we drove through the city. She showed me the building where she had once worked as an elevator operator. We drove through the neighborhood where she and her husband had lived when they were newlyweds. She had me pull up in front of a furniture warehouse that had once been a ballroom where she had gone dancing as a girl. Sometimes she’d ask me to slow in front of a particular building or corner and would sit staring into the darkness, saying nothing. As the first hint of sun was creasing the horizon, she suddenly said, ‘I’m tired. Let’s go now’. We drove in silence to the address she had given me. It was a low building, like a small convalescent home, with a driveway that passed under a portico. Two orderlies came out to the cab as soon as we pulled up. They were solicitous and intent, watching her every move. They must have been expecting her. I opened the trunk and took the small suitcase to the door. The woman was already seated in a wheelchair. ‘How much do I owe you?’ She asked, reaching into her purse. ‘Nothing’, I said ‘You have to make a living’, she answered. ‘There are other passengers’, I responded. Almost without thinking, I bent and gave her a hug. She held onto me tightly. ‘You gave an old woman a little moment of joy’, she said. ‘Thank you.’ I squeezed her hand, and then walked into the dim morning light.Behind me, a door shut. It was the sound of the closing of a life. I didn’t pick up any more passengers that shift. I drove aimlessly lost in thought. For the rest of that day, I could hardly talk. What if that woman had gotten an angry driver, or one who was impatient to end his shift? What if I had refused to take the run, or had honked once, then driven away? On a quick review, I don’t think that I have done anything more important in my life. We’re conditioned to think that our lives revolve around great moments. But great moments often catch us unaware – beautifully wrapped in what others may consider a small one. Serangoon road in Singapore; well known as Little India of Singapore and a haven of shopping for Indians overflows with shoppers especially during major festivals like Diwali and Navratri. Yesterday ie 21st Oct 2014, the eve of Diwali day was no exception. There was hardly an inch of space to move. I had gone there for the last minute shopping for flowers for the Diwali prayers. Crowds thronged each shop as if they were providing freebies. My aunt and I managed to quickly finish our shopping dreading at the prospect of finding a cab and reaching home on time. 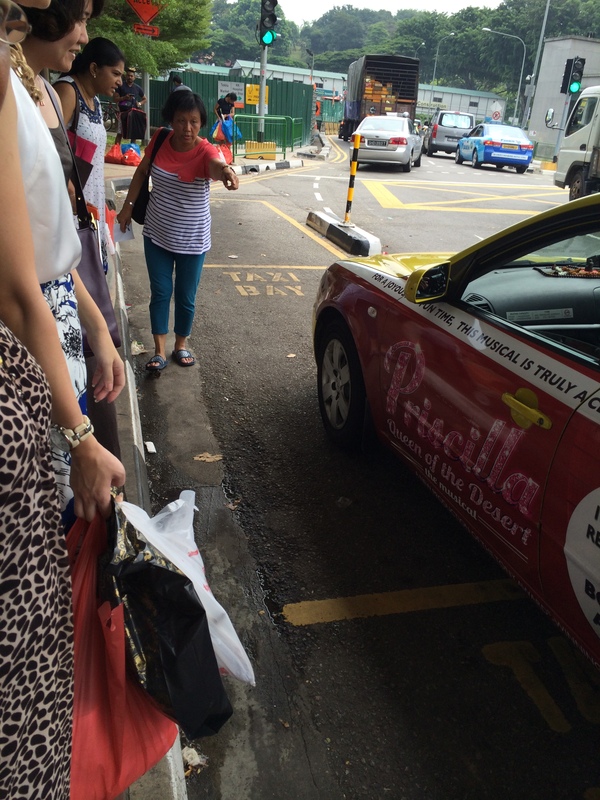 We headed to the taxi stand in Race course road around 2.15pm to see about 10/12 people waiting ahead of us in the queue with loads of shopping. 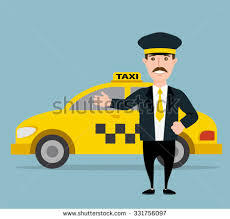 Many taxis were going to some predestined areas, so the availability of taxis were getting very limited. 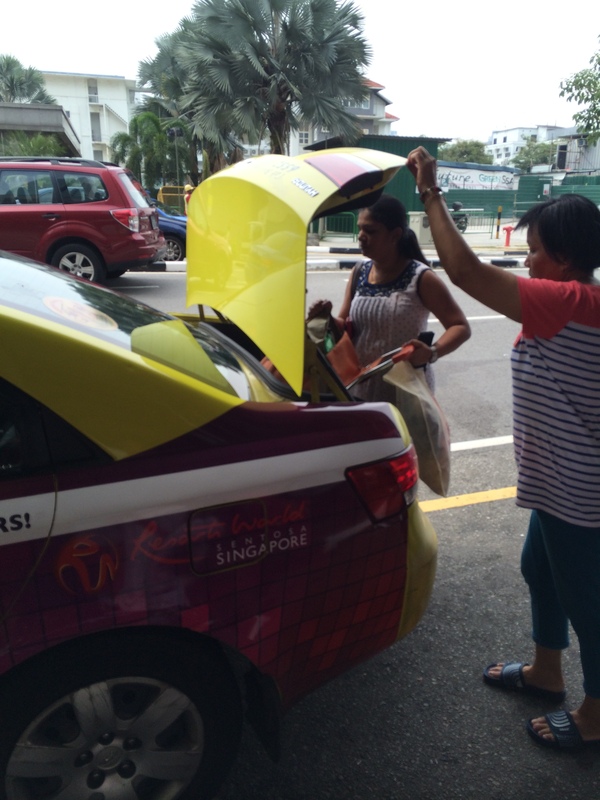 People were anxiously waiting for cabs to reach home at the earliest. Many times during such crowded periods, I have observed people don’t follow rules and tend to just get a cab midway on the road when many people are waiting for hours in the taxi stand. Some of them from behind the queue just take the cab when they know it is proceeding to their destination without even people in the front knowing where the cab is proceeding to. But yesterday the scene was different. I saw a good Samaritan direct and help the people waiting in the queue. I wanted to share this kind act with all of you to make us all realise there are so many people around us who act selflessly and help out others. We should always be grateful and thankful to such people and pass the kind act around. When we find any such opportunity to help people in need we should try to be a part of it and make a difference. I don’t know if someone is usually assigned for this role as I have not seen it any time before in so many years of my living here. Even if she was assigned for this role, she performed her duty with utmost love and sincerity, which one should learn from such people. I appreciate her kind gesture. Thank you, my fellow Singaporean. How to Free your Mind!